University of New Hampshire at Manchester received a B.
U.S. News & World Report's ranking of 45 out of 117 of National Universities Top Public Rankings was a major contributor to this grade. The University of New Hampshire at Manchester, a small commuter college in the state's largest city of Manchester, (population 100,000) has an in-state population of 98%. Degrees are available here in the liberal arts and a handful of professional areas. What are the top 3 reasons someone should attend University of New Hampshire at Manchester? There are plenty of clubs and activities to be involved in and we just moved into a brand new, state of the art building. What is a typical University of New Hampshire at Manchester student like? Describe the type of person that should attend University of New Hampshire at Manchester. A typical UNH Manchester student is usually a business, computer, biology, ASL, or psychology major. UNH Manchester is a commuter school so a UNH Manchester student must like driving. UNH Manchester offers students the best of both worlds--a nationally recognized University of New Hampshire education and the unique opportunities available in a vibrant urban campus setting. Located in the heart of the I-93 corridor, the college brings the resources of the state's flagship university to the region at an affordable, convenient commuter campus. Students, alumni, faculty, and staff play vital roles in the educational, economic, and cultural life of southern New Hampshire and northern Massachusetts. The student body is comprised of a unique mix of traditional-age and older students reflecting the Merrimack Valley's rich ethnic and cultural diversity. The college's 16 undergraduate majors and 15 minors are built on a strong liberal arts foundation with special emphasis on urban issues and the practical experiences needed for successful careers in the future. UNH Manchester also hosts graduate degree programs offered through the UNH Graduate School. UNH Manchester, the 6th college of UNH, was founded on a strong liberal arts base and a dedication to excellence in teaching and scholarship. 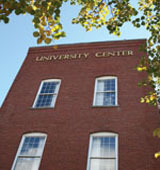 UNH Manchester's central location; day, evening and Saturday class schedules, and blended/online courses make college accessible. UNH is accredited by the New England Association of Schools and Colleges, Inc.
What are the top 3 things that students do for fun at University of New Hampshire at Manchester? A program that prepares individuals to apply basic engineering principles and technical skills in support of engineers engaged in the design and development phases of a wide variety of projects involving mechanical systems. Includes instruction in principles of mechanics, applications to specific engineering systems, design testing procedures, prototype and operational testing and inspection procedures, manufacturing system-testing procedures, test equipment operation and maintenance, and report preparation. The average student pays $17,906 for tuition, fees, and other expenses, after grants and scholarships. Total stated tuition is $13,350, in-state and on-campus, before financial aid. 60% of students receive some form of financial aid. Learn more about financial aid at http://www.manchester.unh.edu/admissions/financial-aid. Estimate the net price for you at http://npc.collegeboard.org/student/app/unh. 42% of students graduated in six years. Want more info about University of New Hampshire at Manchester? Get free advice from education experts and Noodle community members. What was your experience like at the University of New Hampshire at Manchester?